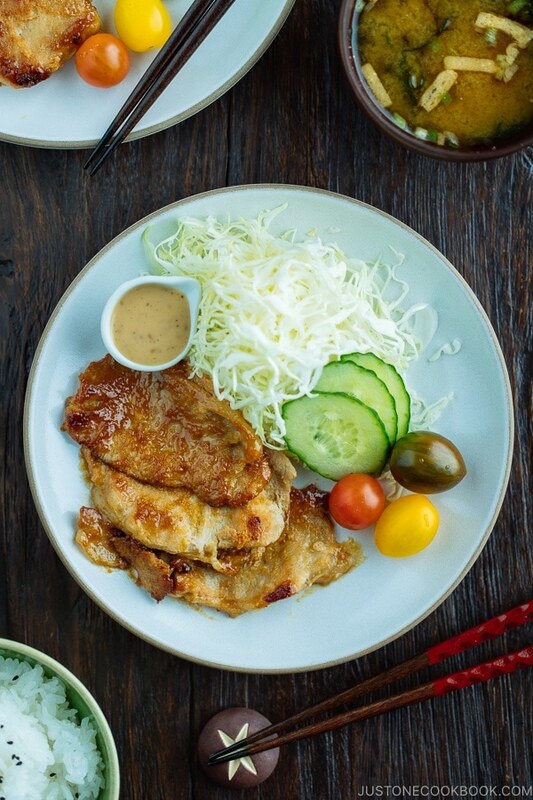 With umami-rich miso, savory soy sauce, spicy ginger, and a hint of sweet mirin, Miso Ginger Pork is a perfect mix of delicious Japanese flavors. 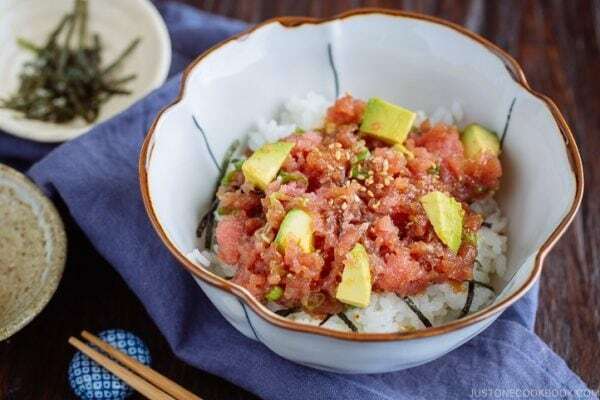 Serve with steamed rice to enjoy this popular Japanese dish! When you start cooking Japanese food at home, you will quickly learn that there are five essential condiments. Today’s Miso Ginger Pork (味噌しょうが焼き) uses four of them: soy sauce, mirin, sake, and miso (leaving out rice vinegar). 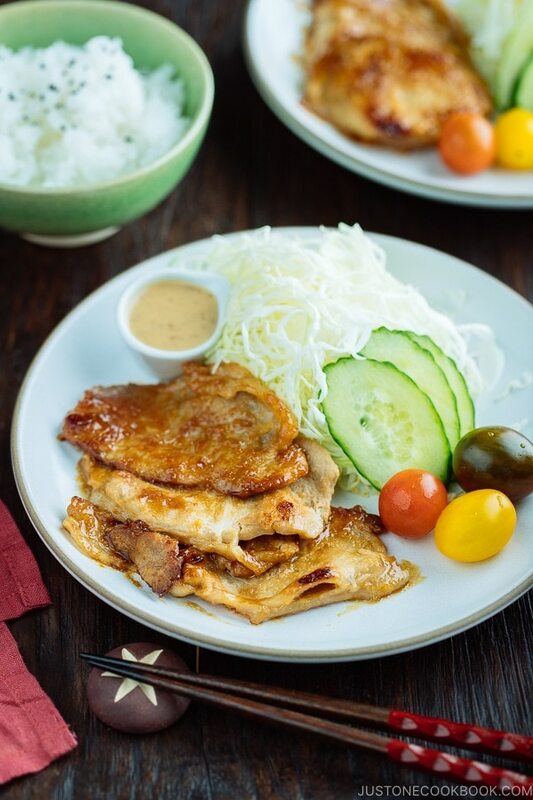 If you already love ginger pork, this Miso Ginger Pork takes the dish to the next level of deliciousness! I often receive emails and messages from readers that they don’t know what to do with the remaining miso that has been sitting at the back of their refrigerator. They often buy a tub of miso to cook with just one or two dishes and end up not knowing what else to do with it. Well, my quick response would be to make Miso Soup every time you serve Japanese dish with steamed rice. But if you are looking for more ideas, my next suggestion is to use miso to season meat and fish. 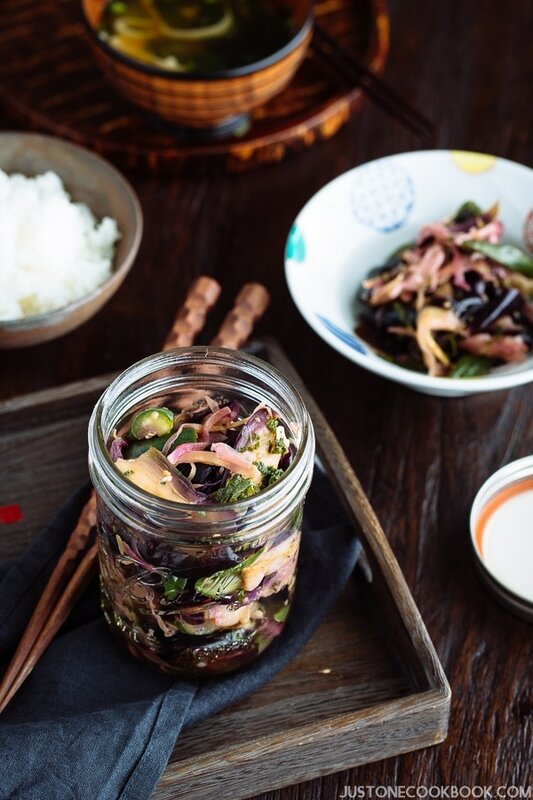 You’ll be surprised at the depth of flavor that miso adds to everything you stir it into. 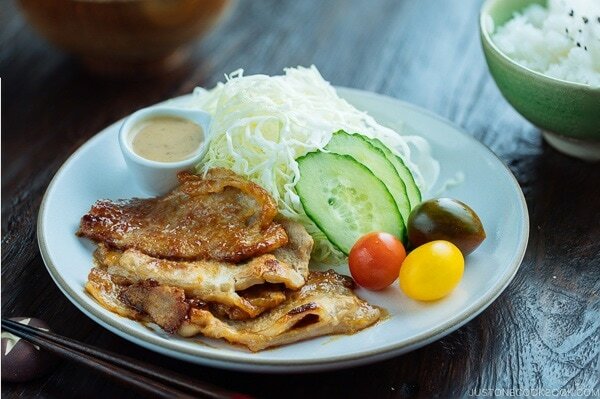 The typical Ginger pork, or Shogayaki in Japanese, is composed of thinly sliced pork (pork loin cut) sautéed with ginger, soy sauce, mirin, and sake. It is one of my favorite go-to dishes as I love the combination of all these flavors. It is also super easy to pull together, guaranteed to hit the dinner table in about 15 minutes. 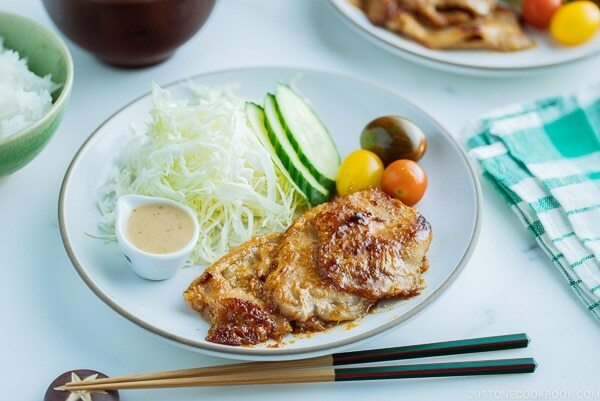 If you have a tub of miso in your refrigerator right now, you can utilize this all-purpose ingredient by incorporating with the rest of seasonings for Miso Ginger Pork. Just a spoonful is all it takes to make the classic home cooked dish extra special. Bear in mind that miso can burn easily, so I don’t recommend marinating the meat for this dish. Make sure the pork is cooked through first, before you pour in the sauce. New to Japanese condiments and not sure what brand of miso to buy? My recommendation is Hikari Miso. 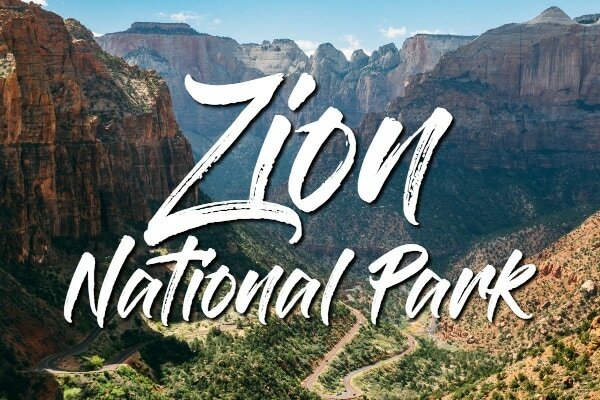 I wish someone told me about this brand when I first came to the U.S. 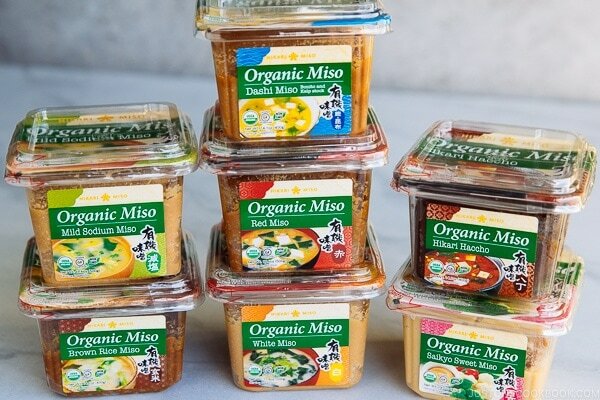 Instead, I’ve purchased, tasted and tested different brands of miso that were available in my local Japanese grocery stores for several years until I finally discovered Hikari Miso. It is undeniably my favorite go-to brand when comes to miso paste. So, I hope I could save you some time. Click here to read more about miso. This post is sponsored by Hikari Miso and I’m really excited that I’m partnering with a company with products that I strongly believe in. I’ve been using their miso every day for almost a decade and I cannot speak any more favorably for their miso pastes. 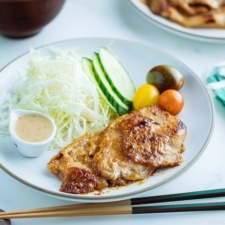 For this Miso Ginger Pork recipe, I’ve used Hikari Miso Organic Miso (White Miso). White miso is the most common paste in the U.S., and its mild flavor pairs well with any dishes and soups. 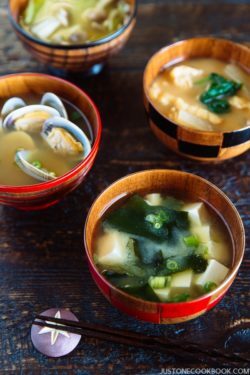 If you have other types of miso – like red or dashi miso – you can still use what you have for today’s recipe. With some planning, this Miso Ginger Pork could be your reliable dinner option. 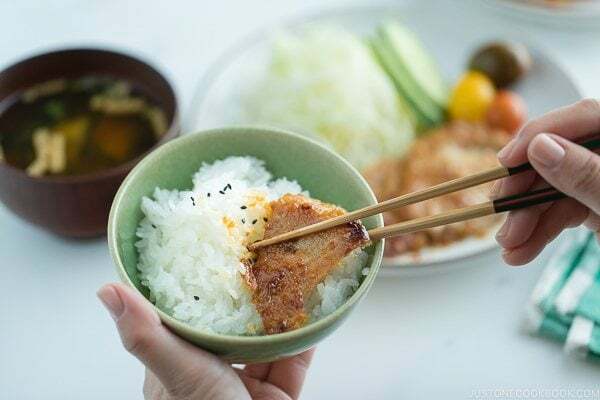 If you prepared steamed rice, miso soup, shredded cabbage (or any type of salad) ahead of time, you can put together this dish in 15 minutes, or even less. 1. Miso gets burnt easily. It’s always good to remember this. Like honey, miso almost always burns easily in the heat. Therefore, I do not recommend adding miso in the marinade for this dish. But if you really want to add miso in the marinade, make sure to remove/wipe off the marinade completely before you pan fry. 2. Use thinly sliced meat. For this dish, you want to use thinly sliced meat so the flavors soak through the meat just fine without marinating. It can be pork loin or pork belly, whichever you can get. Japanese, Korean, and Chinese grocery stores carry thinly sliced meat, but if you can’t find them at your local store, you can cut the meat thinly yourself. Although this classic dish uses pork, you can use other protein choices or vegetables. Chicken, beef, shrimp, mushrooms, or eggplants are just some of the examples that would go well with the sauce. In regards to sake and mirin substitutions, you want to read this post for detailed information. 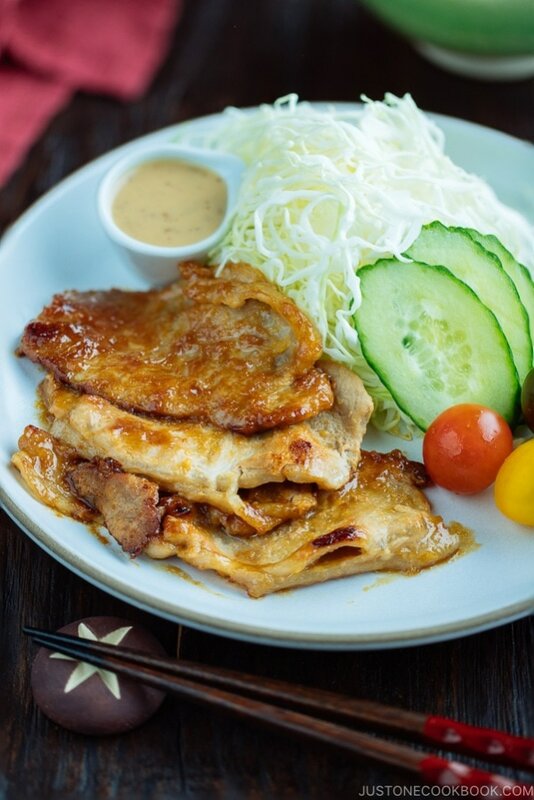 To enjoy the juicy, succulent piece of miso-glazed ginger pork, serve it with steamed rice and some shredded cabbage, cucumber and tomatoes. Okawari (another serving) is guaranteed! Grate ginger and squeeze the juice out. Save 1 tsp grated ginger for later use. 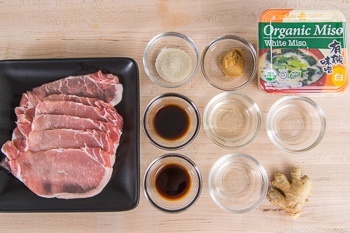 Put only ginger juice in a container that you will marinate the pork with. Add 1 Tbsp sake and ½ Tbsp soy sauce. Then add the sliced pork. Flip and coat the pork with the marinade. Set aside. In a small bowl, combine ingredients for the seasoning: 1 Tbsp soy sauce, 1 Tbsp sake, 1 Tbsp mirin, 1 Tbsp miso, and 1 tsp sugar. And add 1 tsp grated ginger and mix well. Set aside. Heat the oil in the large frying pan over medium to medium-high heat. Add and sear the meat in a single layer. To give a nice even sear, it’s best not to touch or move the meat around. Flip the meat and cook the other side until no longer pink. Then add the seasonings. Coat the meat with sauce using a spoon and flip once to make sure the meat is seasoned on both sides. Serve immediately. 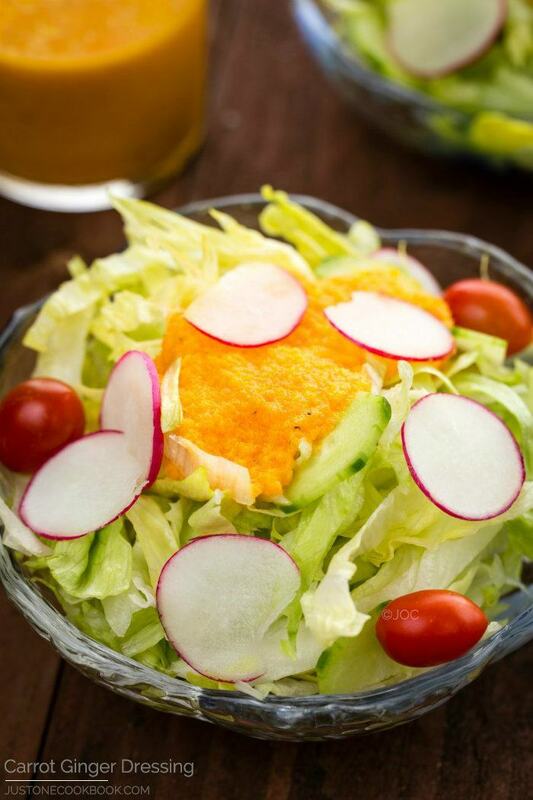 Hi Nami, what is the dressing or sauce in the little cup in the picture? Thanks! When I was very young my Dad use to make this miso pork. He would place it in the middle of the musubi and it was soooo delicious. Taste especially good at the beach. You must try this for your family on a picnic day. Yum!!!!! This was delicious! It’s one of my favorite dishes to order in a Japanese restaurant and now I can make it at home for a fraction of the cost. Not enough mudo flavor… Not too bad, but maybe I did not add enough miso. We did not taste miso flavor that much.